The F2H-2 Banshee is a Rank V American naval jet fighter with a battle rating of 8.0 (AB/RB/SB). It was introduced in Update 1.45 "Steel Generals". The F2H-2 Banshee is a fantastic jet-fighter with great overall speed and good maneuverability. It is most recognized for its ability to remain stable even past its speed limit break (933 kph) and also for its fantastic high-altitude performance. The Banshee is a very stable platform at HIGH speeds. Warning appears at 940 kph; but it can reach over a 1,000 kph and still not rip apart, if flown carefully and kept it in a straight line. Two engines for redundancy. If one is taken out, the machine can still return to base safely. A good advantage to have, due the fragility of jet engine regarding bullet impacts. AB will initially be frustrating. The un-upgraded Banshee is a very poor performer. Its cannons jam, it has a relatively poor climb rate, and acceleration is poor as well. Once upgraded, however, the Banshee is a very effective and useful plane. The F2H-2 is most effectively used as an energy fighter. It has great energy retention, turns well, and accelerates quite well once fully researched. 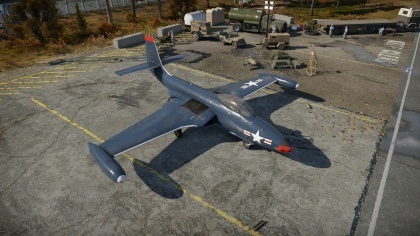 However, the stock Banshee is terrible compared to super-props such as the Tempest Mk.II, F8F-1B, La-9, and others. Therefore, it is recommended to climb at the beginning of a match to at least 4-6 km. The Banshee performs extremely well at these altitudes. However, keep in mind that evasion of superior planes such as the F8F-1B or the MiG-15 is key. Once there, Boom & Zoom can be employed. Make sure your level speed is at least 300 mph due to the fact that the F2H-2 is extremely sluggish below that. However, low-speed stability coupled with an airbrake make the Banshee an extremely good prop-killer. SPEED IS YOUR FRIEND, as you can outrun most jets at your Battle Rating. It is also extremely hard to tear the Banshee's wings. 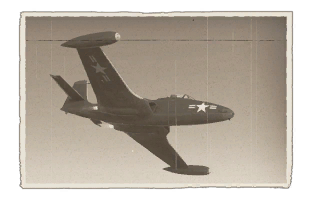 If you are unlucky, you will face the F-86A and MiG-15 in some battles. Avoid them at all costs as they climb far better than the Banshee and have superior top speed. Unfortunately, like most other jets, modifications take a long while to grind. Go for anything that increases the Banshee's climb rate. Leave the cannon ammo belts alone because default has the most HE shells (besides Stealth), and research the New Cannons modification. It will markedly improve the terrible spread of the cannon. The cockpit of the F2H-2 is fantastic- the bubble canopy provides good visibility, rearward and forward. Even with good advantages as a starting jet fighter (if you went with the Naval Line of USA Fighters), it has some disadvantages going up against MiG-15's and MiG-17's. It can certainly outrun La-174's and La-15's with splendid ease, but it will never be able to outrun a MiG once it's on your tail. As for MiG-9's, they can't outrun the Banshee (if fully spaded, careful here) but can probably out-turn it if the MiG-9 pilot is properly trained and experienced. Its main usage will be basically acting as a support fighter in EVERY situation, unless you are down-tiered and you are put against Ho-229's and Me-262's. In such a case, you can become an aggressive fighter and easily get three or more kills. Although, if you are put up against MiG-17's, MiG-15's and La-15's, best prepare yourself to side-climb and be behind your allies. Get some altitude, get some patience and get ready to take out baited MiG's that are either chasing Hunter's or Sabers, or an unfortunate bomber. A good recommendation is that you should never go for IL-28's alone. Other recommendations is that you should never strap in rockets to this thing or bombs, unless you're in a squad and you all have the purpose of bombing points together. It is NOT recommended, either way. Another tip is to always try to hold your speed and REMEMBER to use your airbrakes when being tailed by a MiG. Compressor and Engine are always useful upgrades and all acceleration unlocks are top priority. Given the uniqueness of the AN/M3 armament New 20 mm cannons and G-Suit should be preferable tier 4 goals. The stock belts are better than any other type of ammo, due to more two times more HEFI-T inside of them, but for the improved cannons, they need to be researched, albeit that can wait past the G-Suit. To help with the maneuverability issues, boosters should be considered a priority as well. The Twin Engine F2H Banshee was a follow up to McDonnell's successful FH-1 Phantom. The two aircraft appear very similar. Primary differences include larger airframe, armament, and power-plants. The F2H Banshee was designed to become the Navy's next carrier born aircraft. Nearly 800 Banshees were built. The aircraft was quickly passed over by newer designs. A majority of the F2H's service took place in the Atlantic and Mediterranean oceans. A few Banshees found their way to Korea with the Navy and Marines. VF 172 was deployed to Korea in August of 1951 and immediately saw action escorting B-29s. the Banshee saw limited fighter/bomber duty. The greatest role the F2H played was photo recon. Several aircraft were refurbished and sent to Canada were they saw limited service until the 1960's. Skins and camouflages for the F2H-2 Banshee from live.warthunder.com. The Banshee in flight with other identical aircraft. F2H attacking swarm of Me 262s in test flight mode.